The Brazilian champion was bullish about the prospect of facing the Irishman. 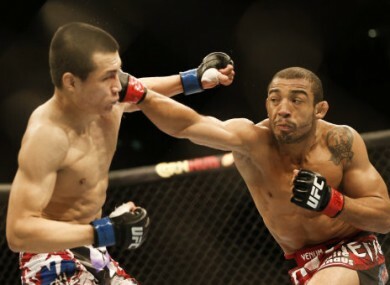 Aldo (right) is one of the most feared fighters in the UFC. fans that he’s coming to Dublin to shut them up. Hundreds of fight fans packed into Boston’s Orpheum Theater on Saturday afternoon for a public Q&A with the Brazilian superstar. Aldo will have the best seat in the house when The Notorious takes on Dennis Siver in the main event in TD Garden. A stadium show in Croke Park and Las Vegas are both under consideration if McGregor wins on Sunday night and cements his shot at the gold. But Aldo warned the Irish fans that the party will soon be over. He said: “It’s going to be a really exciting time for me. It’s going to be great for me to fight Conor McGregor in Ireland. After his most recent title defence against Chad Mendes, Aldo branded McGregor — who was sitting Octagon-side in Rio that night — a clown. McGregor’s rapid rise has injected an energy and excitement into the featherweight division but Aldo insists he has no need to be grateful. He said: “I truly believe that he is the one who has to thank me because I’m the champion giving him the opportunity to fight for a championship. Email “Jose Aldo can't wait to come to Dublin to 'shut up' all of Conor McGregor's fans”. Feedback on “Jose Aldo can't wait to come to Dublin to 'shut up' all of Conor McGregor's fans”.